Hotel ZaZa is a 159 room boutique hotel located in the Memorial City area of west Houston. The mid-century modern hotel offers oversized, stylish accommodations, thought-provoking art, over 11,000 square feet of meeting and event space, a spa and resort-style pool. Camarata Masonry Systems, Ltd. (CMS) supplied and installed over 624,000 Acme Pep 30 Dove Gray king size velour brick, 44,000 8x8x16 CMU, 5,000 10x8x16 CMU, 3,000 6x8x16 CMU, over 5,400 8x8x16 Buff Burnished CMU and 1,304 cu. ft. of cast stone, consisting of over 1,900 individual pieces. All material had to be distributed and installed on each of the seventeen floors. CMS installed most of its work from mast climber scaffolding. Facing a very aggressive 6 month schedule that focused on completing one floor at a time, the mast climber set-up for all four elevations had to be carefully planned. In addition, the mast climbers had to be built to bypass the rooms with balconies that were not uniformly placed throughout the façade by design. Frame scaffolding was used at the balconies to accommodate this design feature, as well as around the pool and for the interior walls. The exterior veneer was sequenced so that CMS would follow preceding trades on each floor. This process was repeated in a spiral fashion working up the building. This type of installation method required that all trades coordinate their efforts and match their crew sizes to the pace of the work. Another unusual design feature called for the brick returns of specific windows to extend out 3″ past the veneer on the south and the north elevations. Solid bricks were used for the returns and special care was required to maintain the noticeable vertical brick lines that ran from levels 6 through 17. As a masonry contractor, our goal was to provide a high quality brick façade while navigating the structural obstacles on the building and keeping pace with the extremely aggressive schedule. Utilizing mast climbers on all four elevations simultaneously and full coordination by all subcontractors and the GC, allowed the project to be competed well in advance of the original schedule. The quality of the installation is exceptional as the brick have an irregular face and the façade has several large uninterrupted expanses of masonry thus requiring good layout and workmanship to remain flat. The decision to install a brick veneer on all 17 floors is reminiscent of the hotels of the past that were built to last. 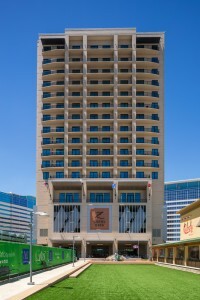 Hotel ZaZa is truly unique and capably fills the void for luxury hotels in the Memorial City neighborhoods and Energy Corridor.